by Alan Hardwick - TV Presenter. It was the coldest morning of the year with a sullen grey sky waiting to coat the icy roads and pavements with snow. The garden pond was frozen, and the papers were late. I sipped my second cup of coffee, thinking about the one thing I had to face before setting off for the office: my daily tussle with the Daily Mail crossword. For years I’ve had this harmless superstition that I must complete the crossword before finishing my second coffee. Would I have time? Not if the papers didn’t arrive soon. Annoying. I once managed the puzzle in less than five minutes. It was a fluke involving some easy clues and wild guesses at long words. The chances of that happening again were remote. I took a big swig of coffee, looked out of the window. Still no sign of the papers. What were they playing at? They had a car. When I was a kid I delivered piles of papers every morning, six days a week, on a bike. A bike, for goodness’ sake. A racing bike my parents had bought, new, for £17 – a lot more than they could afford. But that dashing white Claud Butler (a cut above a Raleigh, I always thought) with derailleur gears, was earning its keep and keeping me in pocket money. The newsagent paid me 17 shillings a week for the six days, with the bonus that on Sundays there was another pound for delivering fat, supplement-filled publications, collecting the money from often surly customers then doing the books. Sometimes they balanced. The books, that is. A few of the customers were definitely unbalanced, like the man in the off-white vest who leaned out of a bedroom window every Sunday, shouted abuse at me for ‘making all that noise when I’m trying to sleep. I work shifts you know’ and lied that he’d already paid the bill in the shop. Or the farmer who allowed his savage German Shepherd dog to menace me. I had to walk up his drive with this huge creature straining at a thick chain, baring its teeth, lunging and growling. One day, just as I’d closed the five-bar farm gate and returned to what I thought was the safety of the pavement, the dog leaped over the gate, a broken collar dangling from its thick neck. It was going so fast it skidded on the road, giving me time to recover from my fear-induced paralysis and pedal away faster than I’ve ever pedalled. My legs were a blur. I could hear the animal running behind, gaining quickly. After about half a mile, thankfully, it gave up the chase. I was shaking and sweating but the worse thing was that I had to retrace the route to deliver papers to the houses I’d passed in my frantic flight. 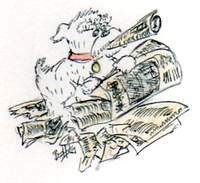 I couldn’t risk another encounter with the dog, so that morning one house received six lots of newspapers. I suppose they were eventually handed over to their rightful owners because no-one complained to the newsagent. The bane of my life for many mornings was a small, yappy mongrel that used to hurl itself at the glass front door of one of the poshest addresses on the round whenever I called. It was kept inside, apparently with the run of the house, but I dreaded the confrontation. No matter how quietly I crept down the drive, the dog sensed I was there. The house lights were always on, and although I never saw the human occupants I always saw the dog, and the dog saw me. It would run snarling down the hall, leap at the door roughly where my throat was positioned and leave a stream of saliva as it slid down the glass. The barking was so loud I wondered why neighbours didn’t complain. It happened every morning until I came up with operation shreddie. 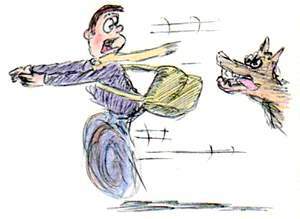 I waited until there were magazines to deliver along with the newspaper, stood outside the door so the dog would start its frantic, futile attack and, one by one, fed the publications slowly through the letterbox, wiggling them about. The dog went berserk. It tore each paper to pieces. The hall looked like it was carpeted in confetti. I repeated the operation just one more time, a few weeks later, but that was enough. For the next three years, whenever I called I heard only the muffled barking of a frustrated pooch that had been banished to the back of the house. It was a sweet victory. I was never late, even when I had to push the bike, laden with its thick hessian newspaper bags, through ankle-deep snow. So where was my daily read now? Another few minutes passed. I cursed quietly. Surely a bit of ice wouldn’t slow them down this much? I bet they’re nice and snug in that car, not braving the elements like I had to. On really cold mornings I’d set off very early, about five o’clock, so that I could spend some time at a row of terrace houses that marked the halfway point of my round. They all had outside lavatories, each with a tiny spirit lamp to stop the pipes freezing. I’d let myself in to the nearest privy, take off my duffel coat, thick hand-knitted jumper, hat, gloves and scarf and sit on the wooden lavatory seat, soaking up the warmth. If it happened to be a day when there were comics to deliver I had a quick read of the Beanos, Dandys, and Rovers. Luxury. I gambled that no-one would be so desperate for the loo that they’d venture outside in sub-zero temperatures. Fortunately I was never disturbed. After ten minutes it was back on with the now pleasantly warm, paraffin-smelling outdoor gear and back into the bitter cold. Now that was a hard life. That was really working for your money. Another few minutes passed, then another. I looked at the almost-empty coffee cup. If I took the last swig before I finished the crossword, who knows what would happen? You don’t mess with superstition, even if it is one you’ve invented. I thought: ‘At least I have a big letterbox, fitted at waist height in the door. Not like some of the houses on my round’. Sometimes the letterbox was at the bottom of the door, which meant getting down on hands and knees to push the papers through. Often I left most of the paper sticking out, particularly on rainy days. You’ve got a soggy paper? Serves you right. Replace your stupid letterbox or cancel your order. I never actually said that, of course, but I thought it very loud. Worse still were the letterboxes with sharp metal edges, specially designed to amputate the tender fingers of newspaper boys (it was no job for girls in those days). After several bloody encounters I ran out of patience and sticking plasters. 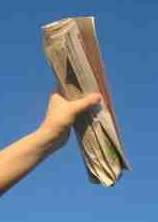 To vent my simmering the newspapers destined for the offending letterboxes were rolled into a tube so that I could scrape off as much of the front page or sports page as possible, leaving streamers of newsprint flapping outside. I can’t claim anyone actually changed a letterbox but I savoured my morsels of revenge. Well, time’s run out. I have to leave. I just can’t bring myself to finish the coffee before I’ve done the crossword. Wait a minute, that’s it – I won’t finish the coffee. I’ll leave it here on the sink, do the crossword when I return home, heat up the coffee in the microwave and get round the superstition that way. Whoa, steady. This is sounding suspiciously oddball. And actually, if the paper IS delayed because of the icy roads I can use the weather as an excuse for turning up late at the office. So that gives me, let’s say, another five minutes. If the paper hits the mat in the next thirty seconds I’ll double the Christmas tip. Christmas tip? That really brings the memories flooding back. My round was made up of three distinct sections. The first was a collection of privately owned detached houses on either side of a steep hill. Most had cars at a time when car ownership was not common. Then I had to cycle to the top of an even steeper and longer hill, where the second lot of houses were the terraces with outside loos. They were in a poor state, rented by people who couldn’t afford council properties with luxuries like bathrooms. Beyond them, separated by a field, were more neatly laid-out detached houses. I received not one penny in tips from the private houses. I imagine they thought their newspapers arrived by magic. The people in the terraces, without fail, either got up early to give me a few coins or left the coppers wrapped in paper on the front step with a thank-you note, or maybe just a pencilled ‘for the paper boy’. Christmas is the one time of year when customers can show their appreciation for a job well done throughout most of the other 360-odd days. As far as newspaper deliverers are concerned, they’re worth it. I don’t care if it is a business. It’s a mostly thankless task. Getting up well before dawn, sorting the papers and then taking them from house to house is tough. Those American kids, hurling newspapers in the vague direction of a front porch as they power past on their BMX’s don’t know they’re born. And yet they all deserve a token of thanks at Christmas. Hang on – it’s the paper. I knew they wouldn’t let me down. Never doubted it. So, pen at the ready. One down…easy. One across, ‘Festive greeting’ ..Five letters and nine letters. Starts with M. Oh yes, Merry Christmas! My paper round was a lot more than a source of income; it genuinely changed my life. When I started, I was a very overweight, unfit 12-year-old who’d come a humiliating last in the school cross country run, watched by hundreds of laughing, jeering pupils. After a year of early rising, carrying heavy bags and riding a bicycle for two hours, seven days a week, I joined the school cross-country team. Sports days found me entering all the distance races. I took up tennis, swimming and crown green bowling. Later I started fencing classes – no, not garden fencing; this was the sort where you use swords. 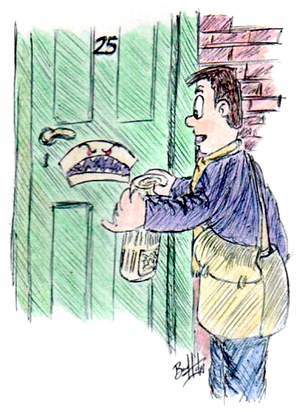 Being a paper boy left an indelible mark on me, quite apart from the small scar on my right index finger from the razor-edged letterbox at number 25.